High in the mountains of Transylvania lives the sinister Count Dracula. When Jonathan Harker is invited to the Count's castle, he discovers a horrific plot to create an army of the undead. Can vampire hunter Professor Van Helsing help Jonathan and his friends thwart Dracula's evil plan before it's too late? The terrifying suspense never stops in this blood-curling graphic classic. That book was EPIC! Especially the part where Jonathan almost got bitten by the female vampires. The front cover - wow! 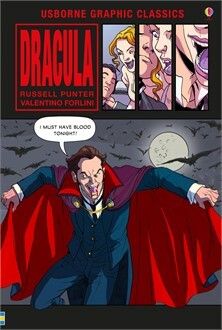 - Dracula has blood dripping from his fangs which looks awesome. I loved the fact that Lucy got bitten and turned in to a vampire. I read it in less than 2 days because it was so good. I want to read more books like it.